Oregon’s old-growth landscape is divided similarly to Washington’s with Sitka spruces near the coast, Douglas firs dominating the Cascade Range foothills, and western red cedars sprinkled throughout. It is thought that before extensive logging, Oregon’s coast may have held some of Cascadia’s largest and tallest trees. Today, only a few scattered pockets of protected areas can take hikers back to what Oregon’s forests 150 years ago but those pockets are absolutely beautiful. Travelers to the state’s northern coast may encounter notable specimens like the Cape Meares Giant and the toppled Klootchy Creek Sitka Spruce as well as ancient forests near Cannon Beach. Further south, Oregon is home to some of the tallest living Douglas firs today, including the Doerner Fir, the tallest non-redwood tree on the planet at 327 feet and 3 inches tall. Further inland, several federally protected wilderness areas, including Willamette National Forest and Umpqua National Forest offer hikers access to remote valleys and hikes with amazingly beautiful old-growth scenery. On Oregon’s wild northern coast, a grove of large western redcedars reside in relative obscurity. Despite the widespread logging that has befallen the region, the trees in this recently discovered grove remain intact. In order to protect their wild state, I’ll refrain from providing exact directions but suffice to say, reaching them requires a bit of bushwhacking. The trees here are hundreds of years old and the grove contains the largest western redcedar in Oregon, the Arcadia Cedar (picture one). The cedar is likely over 800 years old and has been able to survive the many tsunamis that have crashed into Oregon’s coast over the last millennia because of its position high on a hill. 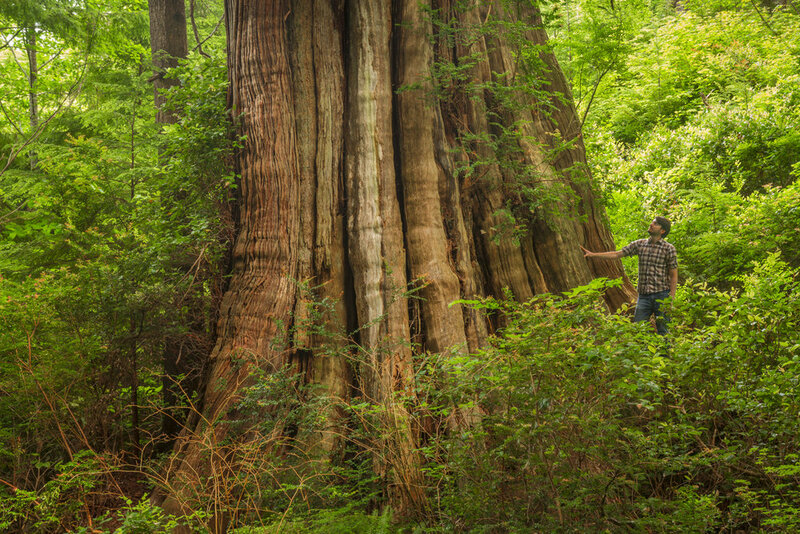 The cedar was measured in 2010 by “Ascending the Giants” (an Oregon-based group of tree climbers and enthusiasts), officially making it Oregon's champion western redcedar at 17 feet in diameter, 152 feet tall with a 70-foot crown spread. Cape Perpetua, within the larger Siuslaw National Forest, contains the only entirely intact ancient forest watershed on the Oregon coast. 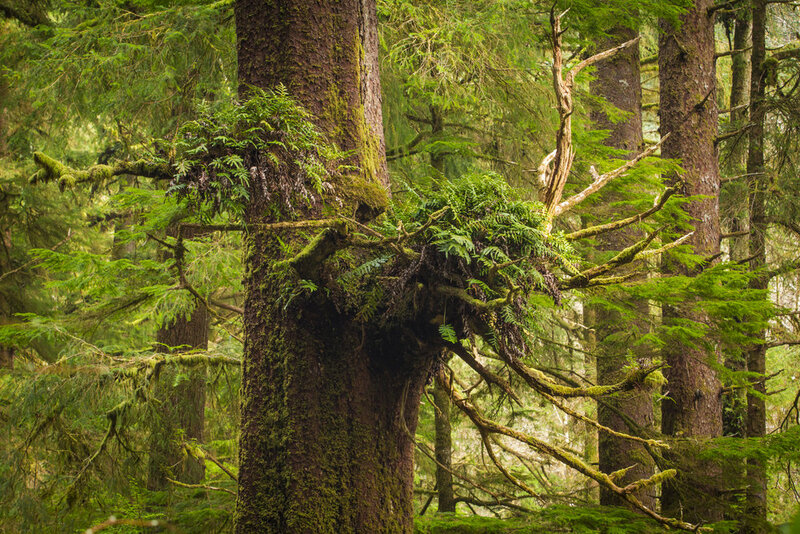 The forests here are primarily dominated by sitka spruce, moss, and lush ferns that are nourished by the mist and rain during the long, wet winter months. Several creeks have cut into the landscape creating steep hillsides, which filter water down the slopes and protect trees from windstorms that rock the coast. The biggest trees are located near these creek banks, including the 550 year-old “Giant Spruce of Cape Perpetua” (picture one) on the Cape Creek, which measures 40 feet in circumference and 165 feet tall. This tree began its growth as a seedling on a nurse log, which decomposed over many years, leaving the tree with what appears as “feet” reaching the ground. More giant sitka spruces and Douglas firs can be found on both the south end of the Gwynn Creek Trail and the bicycle-friendly Cummins Creek. These trails offer magnificent glimpses into what the entire Oregon coastal forest looked like a couple centuries ago. The Klootchy Creek Sitka Spruce Giant (also known as the “Klootchy Creek Giant” or the “Seaside Spruce") is a nearly 800-year-old giant that used to hold the title of Oregon's biggest tree. A violent windstorm in 2006 caused a large amount of rotted wood to break free from the tree at the site of an old lightning scar and one year later, the tree fell victim to a second windstorm that broke off the trunk about 80 feet from the ground. In February 2011, the Oregon Parks Department had a further 40 feet or so of the remaining snag cut off, due to concerns about decaying wood falling from the trunk and putting visitors at risk. Though no longer rising to its 200-foot height, the tree's 17-foot-diameter trunk and two fallen sections still convey to visitors the giant spruce's massive size. The downed portions have been left in place to serve as nurse logs for a new generation of Klootchy Creek giants. At its height, it shared the title of world’s largest Sitka spruce with the Quinault Lake Spruce (and possibly the Queets Spruce) in Washington’s Olympic National Park. Often overshadowed by the much more popular and oddly-shaped “Octopus Tree” in Cape Meares National Wildlife Refuge, the Cape Meares Giant is a massive example of the huge Sitka spruce trees that existed in coastal Oregon, Washington, and British Columbia. The tree is easily accessible within the Wildlife Refuge via a mainly flat path less than half a mile in length. Also know as “Big Spruce,” the tree was designated the state champion in 2008 when the Klootchy Creek Spruce (featured in the post above) lost its upper half. The Cape Meares Giant also has a missing top, but it's giant girth gives it enough bulk to make it the “official biggest spruce in Oregon.” It is 144 feet tall, 48 feet in circumference, 15 1/2 feet in diameter, and estimated to be 750 to 800 years old. Recent findings have upended the Cape Meares Giant’s title as Oregon’s largest Sitka spruce. Today, Oregon's actual largest Sitka Spruce, is Falcon's Tower, located in nearby Oswald West State Park. A short 10-minute drive from Cannon Beach, Oswald West State Park shares much in common with its southern neighbor, Cape Perpetua. Both are coastal parks dominated by old-growth Sitka Spruce forests, which grow near streams that flow into the ocean. Unlike Cape Perpetua, however, Oswald West contains tall ocean-facing cliffs, eroded over millennia by the constant pounding of the ocean. Though many tourists visit primarily to hike the dramatic, cliff-hugging Cape Falcon Trail, several of the park’s flat and accessible southern trails that traverse the lowland forests offer some of the best old-growth hiking in coastal Oregon. The watershed between Short Sand Creek and Necarney Creek, where these short trails are located, is filled with giant trees contoured into weird and interesting shapes. The whole area is incredibly verdant and brimming with vegetation. 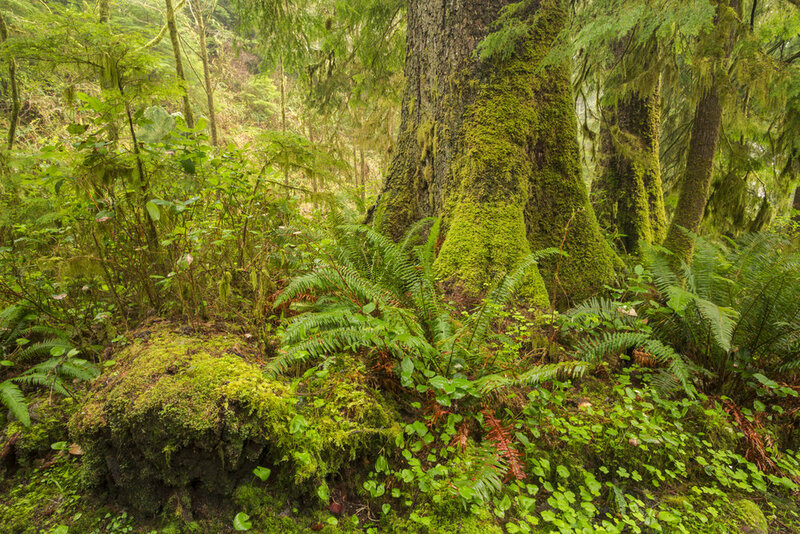 The region’s ample precipitation allows small, photogenic plants, leaves, and ferns to dominate the forest floor for much of the year, growing on and around the ancient trees.